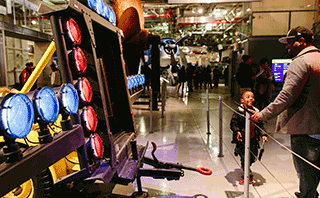 Beginning April 26, the Intrepid Museum will open its doors select Friday nights for FREE from 5:00pm–9:00pm! Explore the Museum and enjoy a variety of free after-hours programming including lively conversations, exciting performances, telescopes for viewing the night sky and movie nights on the flight deck! There's something for everyone during Free Fridays, however please refer to detailed program descriptions for age ranges and registration requirements. There will be no access to the Submarine Growler or Concorde during Free Fridays. Last entry is 8:30pm. First-come, first-served. Stay tuned for more information. Get ready for some sizzlin' excitement at Mad Science: Fire & Ice. Learn about the properties of fire and combustion in this live, interactive (and safe!) experience on the ship's hangar deck. Join us for intergalactic yoga—led by Guerilla Science—in the Space Shuttle Pavilion. Stretch like an astronaut and uncover what happens when your mind and body leave the soothing gravity of Earth. Enjoy views of the Hudson River and city skyline while you watch a film from Intrepid’s flight deck. The movie begins at sunset, weather permitting. With the 50th anniversary of the Apollo moon landing less than a month away, visit the Museum's Space Shuttle Pavilion for our new installation—Media, the Moon and Beyond. Experience the feelings and emotions of that historical moment through archival news media from the era. Explore the universe in the Museum's pop-up planetarium, with our educator-led shows that will take you around our galaxy and back again. The show will run every 45 minutes. Celebrate the Apollo missions with Dr. Noah Petro who will use images from NASA's Lunar Reconnaissance Orbiter at the Museum's Astronomy Night. Following the talk, enjoy stargazing on the flight deck with high-powered telescopes (weather permitting). Advanced Registration Required. All ages. Enjoy views of the Hudson River and city skyline while screening a feature film from Intrepid’s flight deck. This film will be selected by the community; check the Museum’s website to vote on your favorite! The movie begins at sunset, weather permitting. First-come, first-served. Stay tuned for more information. Learn about the forces of flight and NASA's journey to the red planet at our special Spanish-language education demos and tour guide talks taking place throughout the evening. Join us in the Space Shuttle Pavilion for Innovators where you'll hear from entrepreneurs using NASA technology for the betterment of all. 21+ Beer and wine available for purchase with valid ID. Explore the universe in the Museum's pop-up planetarium, with Intrepid Educator-led shows that will take you around our galaxy and back again. Every 45 minutes. Celebrate Halloween with a special Astronomy Night and learn about the spookiest planets in the universe from American Museum of Natural History senior scientist Jackie Faherty. Following the talk, enjoy stargazing on the flight deck (weather permitting). Advanced Registration Required. All ages.